Her idea is to host a weekly round-up of the recipes that we, foodbloggers, have created/made and want to share with others via her great blog. What an awesome idea, thanks!!! This "Saffron Sauce" is a big hit at my home. It goes ever so well with fish, thus the marriage with the lump eggs could only be good and successful. 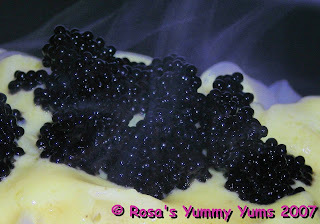 Although, I don't particularly like fish eggs (especially salmon eggs, eeeekkk!!! 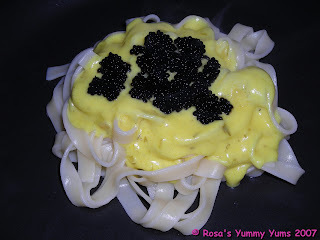 ), this recipe was quite to my liking as the taste of the lump eggs was tempered and made more pleasant thanks to the "Saffron Sauce" that added a round, creamy and slightly acid touch that contrasted perfectly well with the particular flavor of the sea (iodide). 1. Place a pan over medium heat and melt the butter, then add the shallots and cook them until translucid. 2. Add the wine, vinegar, mustard and crumbled cube of chicken stock. 3. Stir and let simmer for 5-8 minutes, uncovered. 4. Meanwhile, blend the cream together with the cornstarch. 5. Then, add this mixture to the simmering sauce. 6. Stir and cook until thickened. 7. Add the saffron and let it infuse. Salt and pepper to taste. 8. While the sauce is slowly simmering, fill up a big saucepan with water and bring to the boil. 9. Add the tagliatelle and lower the heat. 10. Cook for about 6 minutes or until the pasta are "al dente". 11. Strain the pasta and return to the pan. 12. 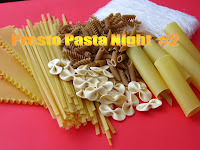 Add 2 tablespoons butter and stir well so that the pasta are well coated. 13. 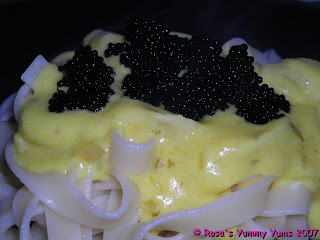 Place the tagliatelle on a plate, then add the sauce and top with 2 teaspoons lump eggs. If desired, you can add a teaspoon tarragon or basil (fresh or dry) to the sauce. You can prepare the sauce in advance and just reheat it before serving. Eat this dish alone or accompanied by an arugula salad (see recipe link) and a good bottle of Chardonnay, Sauvignon or dry Champagne.